Classic and clinical variant galactosemia are rare genetic metabolic disorders. The patient with classic galactosemia carries deleterious mutations in both copies of their GALT gene so that their blood shows essentially no detectable residual GALT activity. The patient with clinical variant galactosemia also carries deleterious mutations in both copies of their GALT gene, but one or both mutations leave a small amount of residual GALT activity. In the vast majority of cases, the GALT mutations in classic and clinical variant galactosemia are inherited so that both parents of an affected child are carriers. Rare exceptions occur. Patients with classic galactosemia are sometimes described as having the genetic makeup "G/G." When a person who does not have galactosemia consumes food containing lactose (e.g., dairy products such as milk, cheese, butter), their body breaks down the lactose into galactose and glucose, and then further metabolizes both of these sugars. The human body also is able to make “endogenous” galactose. When a person with galactosemia consumes food containing lactose or galactose they are not able to fully metabolize the galactose, so it can build up in their cells and tissues. Galactose that is synthesized in the body may also build up. Other molecules derived from galactose, such as galactose-1-phosphate (Gal-1P), galactitol, and galactonate, may also build up in the cells and tissues of patients with galactosemia, especially if they are consuming high levels of dietary lactose or galactose. Untreated, classic and clinical variant galactosemia are potentially lethal disorders. If an affected infant continues to drink milk the baby may develop symptoms that progress in days from jaundice, vomiting, and diarrhea, to liver disease and failure to thrive, and eventually to E. coli sepsis, which can be fatal. Diagnosis is made usually within the first weeks of life in follow-up to newborn screening, which is a blood test from a heel prick offered to all newborns in the United States and many other countries. Treatment for classic or clinical variant galactosemia requires the immediate and strict exclusion of lactose/galactose from the baby’s diet. This is usually accomplished by switching the baby from drinking breast milk or a milk-based formula to drinking a low galactose formula, such as soy or elemental formula. Even with early diagnosis and careful restriction of lactose/galactose from the diet, however, patients with classic and clinical variant galactosemia remain at increased risk for long-term complications that include speech and language, fine and gross motor skill delays and specific learning or cognitive and behavioral disabilities. Some patients experience many of these complications; others do not. Primary or premature ovarian insufficiency is also very common among girls and women with classic and clinical variant galactosemia. Prenatal diagnosis by genetic or biochemical testing is available. Duarte variant galactosemia, sometimes called just Duarte galactosemia or “DG,” is much more common than classic or clinical variant galactosemia in many populations and also results from mutations in the GALT gene. However, instead of carrying severe mutations in both copies of their GALT gene, patients with Duarte variant galactosemia carry one GALT copy with a severe (G) mutation and a second GALT copy that is only very mildly impaired and that shows characteristic sequence changes that classify it as "Duarte” (also called D or D2). A child with Duarte variant galactosemia therefore generally has one parent who is a carrier for a severe (G) GALT mutation, and one parent who is a carrier for the Duarte variant. People with Duarte variant galactosemia usually show about 25% the normal level of GALT activity in red blood cells. In contrast, people with classic galactosemia usually show less than 1% the normal level of GALT activity in red blood cells. Newborns with Duarte variant galactosemia may not show any symptoms, such as jaundice, while drinking milk. Historically, experts have disagreed about whether infants with Duarte variant galactosemia should be put on a lactose/galactose restricted diet, and until recently no one knew whether older children or adults with Duarte variant galactosemia are at increased risk for long-term developmental complications. Previously reported studies of developmental outcomes in children with Duarte variant galactosemia were small or indirect and gave mixed results. One prior study of hormones indicative of ovarian function suggested that girls and women with Duarte variant galactosemia are unlikely to experience premature ovarian insufficiency. In 2019, the results of a large study of diet and developmental outcomes in Duarte variant galactosemia was published. Here is a link to read this paper and to find a short video about the project (http://pediatrics.aappublications.org/content/143/1/e20182516). This new study found no significant difference in developmental outcomes tested between children with Duarte variant galactosemia and unaffected children, and also found no significant difference among children with Duarte variant galactosemia as a function of milk exposure in the first year of life. Newborns with Duarte variant galactosemia may or may not be detected by the same newborn screening test that detects classic or clinical variant galactosemia. Specifically, some newborn screening protocols detect Duarte variant galactosemia, while others do not. Receiving a "normal" newborn screening result for galactosemia therefore may not rule out a diagnosis of Duarte variant galactosemia. What is Galactokinase Deficiency Galactosemia? Galactokinase deficiency results from inheritance of deleterious mutations in the human GALK1 gene leading to loss of galactokinase (GALK) enzyme activity. 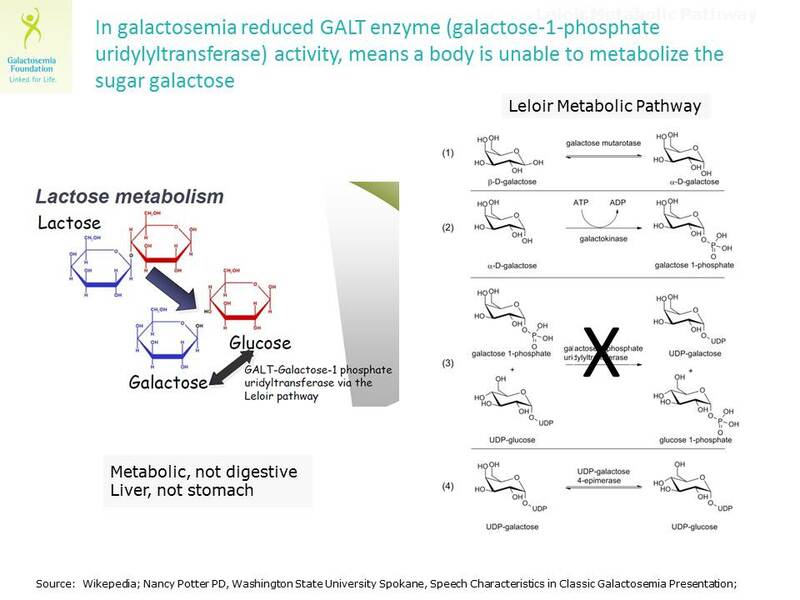 Like patients with loss of GALT activity, patients missing GALK activity cannot fully metabolize galactose so that if they consume a diet high in lactose/galactose they will accumulate high levels of galactose and galactose metabolites including galactitol and presumably galactonate, though this metabolite is rarely measured. Unlike patients who are missing GALT activity, patients with galactokinase deficiency do not accumulate high levels of Gal-1P because GALK is the enzyme that synthesizes Gal-1P. Galactokinase deficiency is very rare in many populations and is not detected by many newborn screening programs so that long-term follow-up studies of large numbers of patients diagnosed with galactokinase deficiency have been difficult to conduct. Because those patients with galactokinase deficiency studied were ostensibly well as infants, except for cataracts that self-resolved following dietary galactose restriction, loss of galactokinase was believed to be relatively benign regardless of diet. That assumption was challenged in 2011 when Hennermann and colleagues (J Inherit Metab Dis (2011) 34:399–407) reported the identification and follow-up of 18 patients with galactokinase deficiency detected in Germany by newborn screening between 1991 and 2010. Almost half of these patients were of Romani ancestry, a population believed to have significantly increased prevalence of GALK deficiency relative to other populations studied. What was striking about these patients is that despite their early detection, of the 16 who were old enough to be evaluated, 31% demonstrated what was described as "mental retardation" attributed to "poor compliance" with dietary galactose restriction. The negative outcomes noted did not associate with consanguinity in these families. This result raises the strong possibility that accumulation of galactose metabolites, other than Gal-1P, in these patients contributed to their increased risk of intellectual disability. Newborns with galactokinase deficiency may or may not be detected by the newborn screening test for galactosemia. Specifically, some newborn screening protocols are designed to detect galactokinase deficiency, while others are not. Receiving a “normal” newborn screening result for galactosemia therefore may not rule out a diagnosis of galactokinase deficiency. What is Epimerase Deficiency Galactosemia? Epimerase deficiency results from inheritance of deleterious mutations in the human GALE gene leading to partial loss of UDP-galactose 4’-epimerase (GALE) enzyme activity. Like patients with loss of GALT or GALK activity, patients with impaired GALE activity cannot fully metabolize galactose. However, unlike patients with classic galactosemia or galactokinase deficiency, all patients with epimerase deficiency reported to date exhibit only partial loss of enzyme activity. Studies from a fruit fly model of GALE loss (Sanders et al, Disease Models and Mechanisms 2010, 3(9-10):628-38) demonstrated that complete loss of GALE activity was lethal early in embryonic development, perhaps explaining why all live-born patients with epimerase deficiency show the presence of at least some residual GALE activity. Patients with impaired GALE activity may be categorized as having one of three forms of epimerase deficiency: (1) generalized epimerase deficiency which results from profound but not complete loss of GALE activity, (2) intermediate epimerase deficiency which results from partial but not profound loss of epimerase activity in multiple tissues, and (3) peripheral epimerase deficiency which results from loss of epimerase activity only in some cell types (e.g. red blood cells) but not in others (e.g. lymphoblasts or liver). In terms of clinical severity, generalized epimerase deficiency is similar to classic galactosemia, peripheral epimerase deficiency is generally considered benign, and intermediate epimerase deficiency is of unknown clinical significance. Generalized epimerase deficiency is extremely rare; other forms of epimerase deficiency may be much more common, especially in specific populations. Because many newborn screening programs do not detect epimerase deficiency, the exact prevalence in most populations remains unknown. Newborns with epimerase deficiency may or may not be detected by the newborn screening test for galactosemia. Specifically, some newborn screening protocols are designed to detect epimerase deficiency, while others are not. Receiving a “normal” newborn screening result for galactosemia therefore may not rule out a diagnosis of epimerase deficiency.